Four components are required to obtain an image during laparoscopic surgery: laparoscopic telescope, light source with cable, Endovision1 camera, and monitor. Laparoscopes that are most commonly used have 0° or 30° lenses (range, 0-70°) and a size of 10 mm (range, 2.7-12 mm). Image transmission uses an objective lens, a rod-lens system with or without an eyepiece, and a fiberoptic cable. The advantage of the larger laparoscopes is that they are able to provide a wider field of view, better optical resolution, and a brighter image. From the eyepiece, the optical image is magnified and transferred to the camera and onto the monitor. Light is transmitted from the light source through the fiberoptic cable onto the light post of the laparoscope. A special variant is the offset "working laparoscope," which includes a working channel for passage of basic laparoscopic instrumentation. Use of this type of laparoscope enables the surgeon to work in direct line with the image and may allow a reduction in the number of trocars needed to accomplish a particular procedure. However, the working channel occupies space that would otherwise be used for the optical system; hence, the resulting image is usually of lesser quality compared with that of laparoscopes without this feature. hInlet Medical Inc., Eden Prairie, MN. 'Endovision Pty Ltd., Camberwell, Australia. To prevent fogging of the laparoscope warm the laparoscope in a container holding warm saline before it is passed into the abdomen. The camera system consists of a camera and a video monitor. Earlier, cameras could not be sterilized; hence, a sterile plastic camera wrap had to be passed over the camera and the eyepiece of the laparoscope. The camera wrap was then affixed to the shaft of the laparoscope with wire ties. Fortunately, all currently made cameras can be gas sterilized or soak sterilized, thereby facilitating their use and avoiding a possible source of intraoperative contamination. The camera is attached directly to the end of the laparoscope and transfers the view of the surgical field through a cable to the camera box unit. After reconstruction of the optical information, the image is displayed on one or two video monitors. A wide variety of cameras is currently available: single-chip, single-chip/digitized, three-chip, three-chip/digitized, interchangeable fixed-focus lenses, zoom lenses, beam splitter, and direct coupler. Direct couplers are superior to beam splitters, in which light and image are shared between monitor and eyepiece and in which the surgeon may view the area of interest directly through the laparoscope. Three-chip cameras are superior to single-chip cameras in that they provide a higher-quality image with superior color resolution. To obtain a "true" upright image of the surgical field on the monitor, the camera's orientation mark must be placed at the 12 o'clock position. With 0° laparoscopes, the camera is locked to the eyepiece in the true position. In contrast, with the 30° laparoscope, the camera is loosely attached to the eyepiece of the laparoscope so the laparoscope can be rotated. Accordingly, the assistant must hold the camera in the true upright position with one hand while rotating the laparoscope through a 360° arc to peer over and around vascular and other intra-abdominal structures; the 30° lens thus provides the surgeon with a more complete view of the surgical field than does a 0° lens. The most vexing problem with the laparoscope is fogging of the lens. To prevent fogging of the laparoscope after insertion into the warm intraperitoneal cavity, it is advisable to initially warm the laparoscope in a container holding warm saline before it is passed into the abdomen. In addition, wiping the tip with a commercial defogging fluid or with povidone-iodine solution is also recommended. Should moisture buildup occur between eyepiece and camera, both components must be disconnected and carefully cleansed with a dry gauze pad. Video monitors are available in 13- or 19-inch sizes. A larger monitor does not produce a better picture; indeed, given the same number of lines on both monitors, a higher-resolution image is obtained with the smaller screen. To obtain a better image, more lines of resolution are needed. High-resolution monitors with 1125 lines of resolution must be matched with a camera system of similar capability. Light sources use high-intensity halogen, mercury, or xenon vapor bulbs with an output of 250-300 W. Xenon, 300 W lamps are currently preferred. In addition to manual control of brightness, some units have automatic adjustment capabilities to prevent too much illumination, which may result in a "washed-out" image. 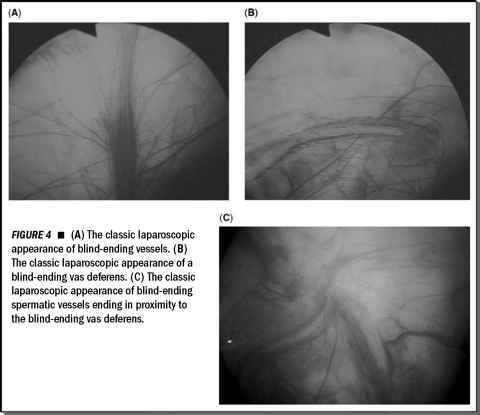 Any breakage of fibers in the fiberoptic cable, which may occur during sterilization and/or improper handling, results in decreased light transfer from the light source to the laparoscope, and hence to the operating field.